Hear from leaders in the manufacturing industry on how comprehensive cloud-based human capital management (HCM) solutions are empowering their organizations. As technology continues to advance at an unprecedented pace, manufacturing leaders must stay on top of new breakthroughs and adapt their business plans rapidly. From compliance audits to administrative overhead, there is a substantive amount of unique challenges the manufacturing industry faces. The complexity of these challenges have caused many manufacturing giants to adopt a unified, comprehensive people management system. A best-in-class cloud-based HCM solution can assist in streamlining processes to reduce overhead and save on costs. Several leaders have already made the switch and are witnessing revolutionary results. Discover how you can achieve these benefits, and more. To continue growing their businesses, manufacturers need to be able to manage their employees efficiently, maximize productivity, and have actionable information for decision making. As the backbone of the global economy, your industry must adapt rapidly to fluctuating challenges, while managing day-to-day operations including overtime calculations, union regulations, a large variety of job codes, and more. These features have already been realized by an enormous number of manufacturers that have come to rely on the greater control and workforce insight afforded by best-in-class HCM. Read on to discover how leading businesses in the industry are applying these solutions with revolutionary results. Recognized as the world leading innovator and provider of filtration systems for nearly 75 years, Culligan maintains offices in 11 countries, dealers and licensees in more than 90 countries, and a network of more than 700 franchise and company-owned dealers across North America. However, Culligan was using a payroll service bureau that handled payroll operations for Culligan’s 800 Canadian employees. The decentralization of its administrative processes, combined with the service bureau’s inadequate functionality and poor reporting tools, created headaches and extra hours for the human resources and payroll staff at Culligan’s world headquarters in Chicago. The HR/payroll team needed a comprehensive HCM solution that would centralize its HR operations, streamline global reporting, provide self-service capabilities, and deliver end-to-end functionality for cross-organizational efficiencies. After a successful deployment that was completed in less than three months, Culligan is now enjoying the benefits of having a single provider for both its employee-focused administrative operations in the U.S. and Canada. By eliminating a separate payroll for Canadian employees, Culligan reduced headcount by five full-time equivalents—significantly cutting costs and simplifying its processes for HR and payroll. Companies who use a comprehensive HCM solution can run hundreds of standard reports, including ROE, headcount, average salary trends, PIER, general ledger, and performance reviews. Reports are pulled down in real-time and can be immediately delivered to executives and managers over the Internet. As Semblex Corporation, a regional manufacturer of fastening solutions, began to expand and open additional manufacturing plants across the country, its corporate leadership knew that the basic functionality of the service bureau could not keep up with the growing business demands. Seeking a completely new solution that offered flexibility, greater control and advanced business intelligence, Semblex settled on a cloud-based, comprehensive HCM solution and never looked back. The provider of cold-formed fasteners, drive systems, and other engineering services had complex and evolving needs. For instance, managing its new facilities and the associated hiring alongside the seasonal variations in its workforce, which includes virtual employees, demanded an expansion of access to crucial data and a reduction in administrative overhead. The leadership at Semblex found these benefits in unified HCM. With 24-7 direct access for employees and managers through a Web portal, the entire workforce gained the ability to control and modify its own data rather than having to request a change from an external provider. “In many ways, we felt like the payroll service bureau owned our information because we always had to depend on it to handle our reporting. With a unified HCM solution, we own our information and the power, flexibility, and control is giving us so many advantages. We’ve really elevated the way we work and the way we are managing our workforce,” said Todd Switzer, Director of Human Resources at Semblex Corporation. Automatic routing for approvals through workflows streamlined these processes even further. The new cloud-based solution was so well-received by the employee base that Semblex stopped printing paper checks and direct deposit forms altogether—resulting in immediate cost savings. Alongside the ease of use and expanded access capabilities, the manufacturer’s HCM solution provided powerful business intelligence tools for reporting and analytics. While its previous system often involved calling a technician on the phone to create or update a specific report, comprehensive HCM allowed the reports to be tailored, produced, and reviewed in-house without delay. “Now, because our unified HCM solution is so easy to use, we can get what we need and have it delivered to internal teams very quickly. The levels of control, speed, and accuracy are big wins for our business. We have a tremendous amount of information that can be made available to executives, managers, and HR teams for strategic analysis and decision-making,” said Switzer. The result was a massively elevated level of control and access to information that was critical for planning and decision-making by managers and the executive team. These benefits have already been consistently realized by Semblex—and its leadership expects even more hard- and soft-cost savings as more HCM features are adopted in the future. As the third-largest coal producer in the eastern United States, Alliance Coal provides more than 39 million tons of coal a year to the nation’s utility plants and industrial users. With mining operations dating back to 1971, the company has grown to more than 4,500 employees in seven states. Alliance Coal was using an enterprise resource planning (ERP) system but felt it needed a more agile, flexible solution to manage the complexities and changes that growing businesses encounter—without having to rely on internal resources. “To provide you with an idea of how complex we are, our miners can have up to 18 earnings codes in a single paycheck,” said Layne Herring, General Manager of Payroll and HRMS at Alliance Coal. “As we continued to expand our mining operations before upgrading our HCM solution, we found it increasingly difficult to update those codes or really make any change in the system. We needed to make enhancements to our technology but were afraid of straining our internal IT, payroll, and HR departments in the process. According to Herring, in addition to helping Alliance Coal be more nimble, their new solution’s self-paced learning options have encouraged adoption of the software and have made it easier and faster for employees and managers to use. By upgrading to a single solution of record to manage all of its people information in one place, Alliance Coal has also gained complete visibility into its workforce. Managers and executives throughout the company are more easily able to access this information to evaluate employee productivity, monitor manpower costs, and receive timely information on trends impacting their workforce. For companies in the manufacturing trade, a flexible, a scalable and powerful HCM solution is a crucial tool for meeting the challenges of the industry. Service bureaus and other providers may provide only a fraction of the functionality and control of unified, cloud-based people management—despite costing more money. On top of that, these options are likely to result in your employee data being fragmented across multiple data sources and tables. Switching to best-in-class HCM can centralize an entire organization’s HR and payroll data and provide greater access while simultaneously offering the strategic business intelligence needed to prepare for the future. More than 4,100 organizations have selected UltiPro as their payroll and HR software of choice. With over 350 manufacturing customers so far, UltiPro has a proven track record of best-in-class functionality and outstanding customer service for the industry. 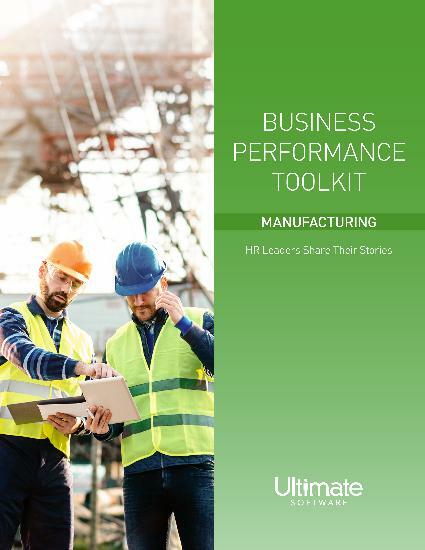 To learn more, watch a brief overview tour and click here to download the Business Performance Toolkit Whitepaper for the Manufacturing Industry. Please fill out this brief form to access your manufacturing toolkit.